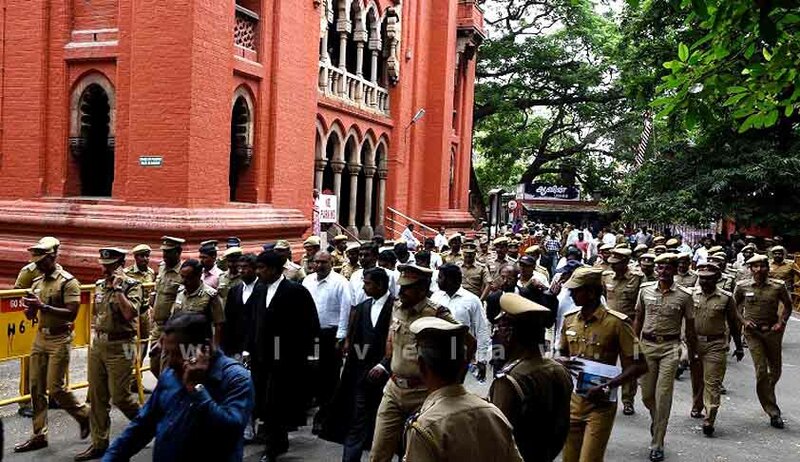 A group of around 35 lawyers of Madurai Bench High Court Advocates Association (MBHAA) and Madurai Bar Association (MBA) on Friday burnt copies of the amended rules at the Integrated Court Complex. The new sets of disciplinary rules for the Advocates enable the Court to debar lawyers who indulge in objectionable behavior. In a notification published on 20th May 2016, new Rules 14A, 14B, 14C and 14D have been added to the existing Rules under Advocates Act. Leading the protest, Advocates A. John Vincent, C. Ezhilarasu and T. Vilavan Kothai stated that the “rules were draconian” in nature since terms such as ‘browbeat’ were susceptible to varied interpretations and curtail the right of lawyers to practice the profession freely. The protest was staged despite presence of Central Industrial Security Force (CISF) personnel on campus. CISF had begun the trial run of the security arrangements in the court buildings, before taking over the security of the main building housing the administrative block and court halls from Monday.